You would have to be an addict of this blog with a spectacularly good memory to recall the tiny part that this blog played in a victory to save parts of the Norfolk Broads which have high levels of protection under EU wildlife laws from being damaged by water abstraction. The last blog here on the subject was over two and a half years ago (see here), and the penultimate one was 15 months before that (see here). 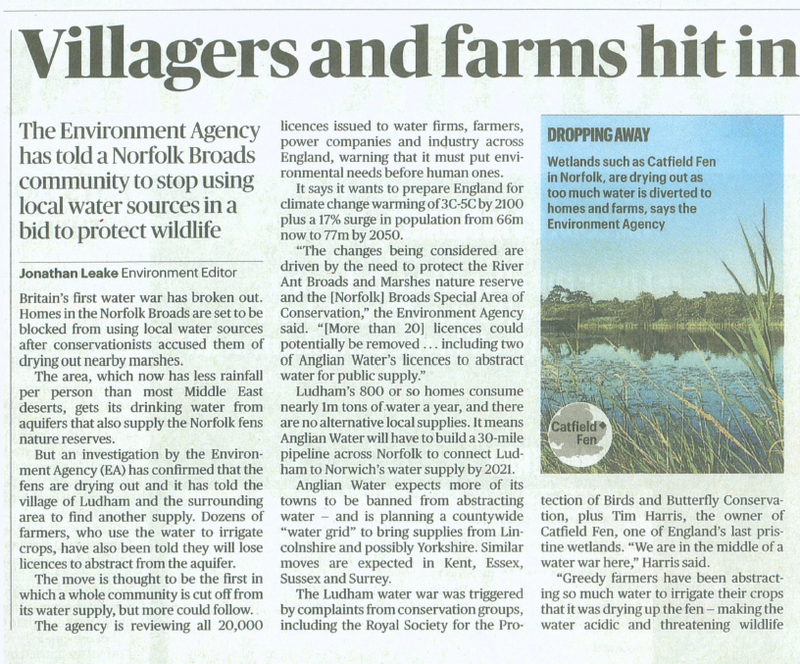 The case was all about water abstraction by farmers damaging wetlands of very high nature conservation value, and getting the statutory organisations (The Broads Authority, The Environment Agency and Natural England) whose job it is to protect such sites to pull their fingers out and do so. So I was interested to see the recent coverage in the Eastern Daily Press and last week’s Sunday Times on the implications of the Catfield Fen case. My personal view is that the domestic need has to be balanced in favour of the residents – quite frankly I would have put that higher than all other requirements,” he said. Second would come farming, with the requirement to provide food. Farming is obviously very important here, but not necessarily growing crops that require huge quantities of water. Sadly, I would say the environment comes third. The environment is certainly important, but not at the expense of people in the area, in my view. Everyone agrees that the Ant Valley contains the finest valley fens in western Europe. It is like the Westminster Abbey of nature. It makes absolutely no sense to destroy Westminster Abbey for the sake of a 15pc profit margin for farmers who can grow wheat and barley [without irrigation] rather than potatoes and salads – which is what they were growing here until 1980 anyway. And for the water companies to resolve their supply issue it is purely a matter of financial investment to bring in water from elsewhere. This is not just restricted to the Ant Valley. 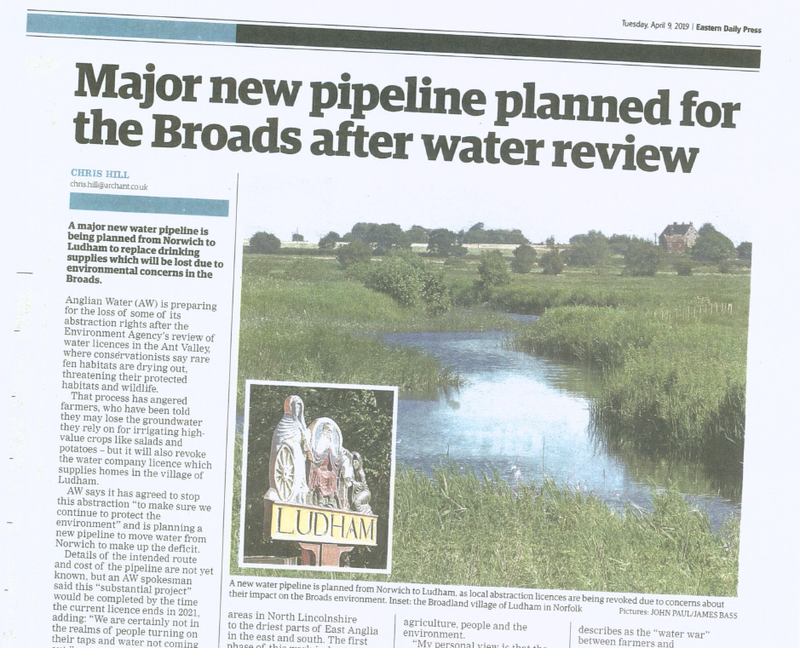 I would be very surprised if the Waveney and the Wensum are not having the same issue. Local politicians, and most non-local ones, will always put some vague ‘people come first’ argument ahead of damage to internationally important sites on their very doorsteps. There is little evidence that locals are the best people to protect their environment when inconvenience or economic disadvantage may be involved. If we are to protect even the very best of our remaining wildlife sites (and most threatened species) we need an overview that makes it difficult to trade off the environment (our shared environment). That overview could be, in a post-Brexit UK, a national overview – but I wouldn’t trust our politicians and our system to deliver it. At the moment it is an EU-wide overview (although its implementation has been carried out by the likes of our government ddepartments and statutory agencies, not by a bunch of Walloon-speaking strangers). I wonder what type of Brexit we might have – will it be an environment-protecting Brexit or will it be awful? Sadly predictable that the Council leader Mr Flett should push 'the environment' to the bottom of the list of priorities. It does make me wonder where he thinks he lives. Mark you cut off. Was that deliberate? It would make Brexit sense or rather nonsense. OK, a blog addict with a very good memory, of course I recall the influence of your previous posts on the Catfield issue. I love Catfield fen, and have spent one weekend per year for the last decade working as a volunteer onthe BUtterfly Conservation-owned section, with the RSPB staff who manage it in the last few years. As a group, the Cambridge Conservation Volunteers, we love our weekend of true solitude there, as it is not a public site, and have seen the damage the drawdown of water has been having - I have spent a weekend digging out the top layer of acidified soil/mud/sphagnum to encourage the alkaline fen water back, with Marsh Harriers overhead. These were experimental diggings, so that the effects could be monitored and the decision on whether or not to expand the management technique be taken. It was always 'abstraction licence pending'. then the joy when we knew the agricultural licence had not been renewed gave us extra impetus to dig anew on the last trial plots. I feel it is a bit harsh to revoke the domestic use, but it does highlight water usage issues and assumptions.. Should this be used as a test case, working with locals to put in place wtaer conservation, recycling of grey water, use of rainwater etc initiatives, to help broaden the viewpoints of those on both sides of this argument... the current decision from EA seems more likely to alienate than help.....A pipeline cannot be the only solution, but alongside education, recycling and change of attitudes should be a more integrated solution to then bring to all of us. Louise - many thanks for your personal perspective, and your work on the site, and your long memory! Sounds to me as if some EA and AW people have been reading Edward B. Barbier’s book, The Water Paradox. Bit heavy going but certainly worth reading if you are concerned about one of the planets major challenges. In a nutshell, water is cheap, way too cheap. Norfolk has plenty of water, it’s surrounded by sea on two sides. Desalination is seen as being expensive but only because we are not used to paying for water. My electric bill for the year is a £1000 plus, my oil bill £2000 plus, but my water bill is just £200. Bizarre. How many people wash two cars per week, shower or bathe every day, water their plants and lawns endlessly throughout the summer and use washing machines for half washes? Why? because of the cheapness of water. Farmers plant acres of potatoes and then water continually whilst they grow. Plus most of the water evaporates or causes poisonous run off into streams, passing on the problems of clean up to others. Why? Because of the cheapness of water. Nobody has any incentive to save water or use it more thoughtfully because it’s almost free. Except, it’s not free. It is a precious resource that has been badly managed for centuries. It’s not free because it’s use and abstraction has major implications for every one of us. Count the cost of a major pipeline to ferry water from county to county, quadruple the cost of of water for all users and desalination suddenly becomes much more affordable. In fact the UK has plenty of water, unlike many countries. Scrap HS2 and spend the money on a pipeline from Scotland to the south and we would have enough to go round. BUT, Scotland would have to be paid for their water. The true market costs of supply and demand would have to be factored in just as if we were buying electric from them. If we don’t put the environment first, above all else, we are all screwed. I suggest that Mike Flett is simply looking to remain a councillor, ensuring that he is voted in next time. I’m sure the views of Mike Flett would be echoed by the vast majority of our councillors and MPs nationwide. Mike Flett is wrong. We have enjoyed(and misused) cheap water for far too long. If we don’t change, and soon, the cost to us all will be incalculable. I agree. It has rained evenless thanusual over thelast year or more in eastern england. Yet nowhere is there an education campaign to get folk to use less water, shower instead of bath, dont water the garden except with grey water or rain water, and I have never understood why anyone needs to wash a car ever. (except maybe to wash mud off a number plate and lights to maintain an air of legality!). Agree strongly with most of this, but just a word of warning about transferring water over long distances. After you have "used" water it usually ends up back in the river system - a large proportion of the water in some rivers can be recycled. Not a problem in itself provided the treatment is good, in fact all part of good environmentally sound water us. However, water from other parts of the country will usually be chemically different. Put lots of recycled but still soft water originally from say Scotland into a chalk stream and you'll devastate the ecology of that stream. I'm sure its true the other way round too, but as it happens most areas of water surplus are soft water uplands. There are also human health issues. Historic lead piping is much less of a threat in hard water areas - put soft water through those old lead pipes though and the problem becomes acute. Now of course we should have replaced all our old lead pipes years ago, but the fact remains that we haven't. Reduce, reuse, recycle, but avoid long distance water transfers please. ps - as someone else noted below, more reservoirs, esp small farm reservoirs, can help a lot too. In Suffolk more water is pumped off the coastal marshes in winter than is abstracted for irrigation on the Sandlings in summer. Farmers are increasingly now storing their winter water instead; win win. There's no one simple solution to water shortage, but there ARE solutions if we just get a bit more creative and treat it as a precious recourse and not a cheap commodity - or worse yet just as a seasonal problem to be disposed of as quickly as possible. . The farm I worked on grew hop plants to sell on to those who actually produced hops. The farm therefore had poly tunnels for the very youngest hop cuttings. These got hot and obviously blocked any rain from getting to the plants so water was piped in for them. Meanwhile the rain hitting the poly tunnels ran down the side and you ended up with quite a serious mud problem on the surrounding roadway and tracks. I always wondered if there could be a way the rain falling on the tunnels could be captured and redirected into them to at least reduce the need for mains water and simultaneously make the farm a bit of an easier place to live and work on. I saw the same problem years later at the Edinburgh International Book Festival, big tents and marquees put up for several weeks with absolutely no attempt at catching the run off from them when it rained, and it can rain a lot in Scotland! There was at least one occasion when the bookfest had to pay for remedial work to the Charlotte Square site because the water damage had been so bad. If you took a 'holistic' look at it capturing the rainwater and then using the toilets on site as a way of getting rid of the captured water would not only have been a way of saving expensively treated mains 'good enough to drink' water, but a way of reducing an onsite problem re sodden ground, damaged equipment and possible remedial work. Just saving mains water might not make this worth looking at (maybe), but with no onsite experience or perspective you could very easily miss out on the full picture. There's one hell of a lot of scope for at least investigating the technical challenges and practicalities in situations like this, but it's rarely if ever done. I think if it was some quite surprising benefits and efficiencies would be discovered and there would be a lot of cursing and regret for not doing it sooner. Indeed Louise. Planning laws should take account of exactly what builders intend to do on any given site. Grey water tanks, rainwater tanks, solar panels, Swift Swallow and Martin boxes. Wildlife areas with ponds. There is so much we could do at not much extra cost, certainly a lot less than adding these things after build. But where do we find the planning and governance that will push these things forward? And cheap will, in the end, be the end for all of us. Mike Flett wins over the environment every time. It was an East Anglia farm I lived and worked on for a year in total spread over a two year period and indeed the water situation was terrible. What was noticeable to me was the virtual lack of any ponds or watercourses in the area, not so much as a damp ditch - except of course in heavy rain in winter with large scale flooding of power lying farmland. The effect on biodiversity was predictable, there wasn't much of it. Irrigation pipes and tubing had to be put in every year for the hops and one of the jobs was to go round repairing the flexible tubes leading from the main hard plastic water pipes as the local rabbit population dug it up and bit into it. I suppose this was a sign the rabbits had limited access to free standing water and were pretty desperate. The local river the Gipping was more like a biggish stream. I'm not sure there would be much scope for increasing water supply, it was obviously being hammered right then. Educating the public about water conservation and recycling has been woefully neglected and water wastage is horrendous. I'm starting to think Karcher power washing the monoblock drive is the new golf and those who still have real lawns are soaking them as much as they ever did. I had thought water metering in the home was going to be universal by now, but that seems to have fizzled out. And why isn't it standard to build in rain water collection for toilet flushing in all new homes? Of course if we cut our food waste that means less water directed towards agricultural use as well as land, fertiliser and pesticide. BTW did anybody notice the name of journalist who wrote the article about water shortages in the EDP was Leake? Around here on the SUffolk sandlings the veg farmers are building reservouirs to hold winter water. They should be encouraged at planning to put floating nesting islands on them. Would nice gravely ones near the sea encourage terns which have to be defened on the beaches from those dont you just love 'um dog (owners).